Carly Behm | The PHOENIX Loyola Academy alumnus Rev. 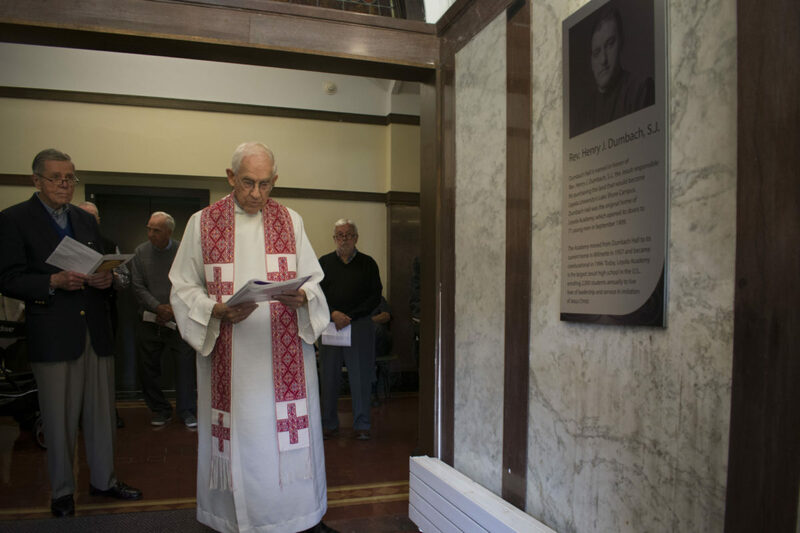 Robert Oldershaw blessed the Dumbach memorial plaque at its unveiling Sept. 13. 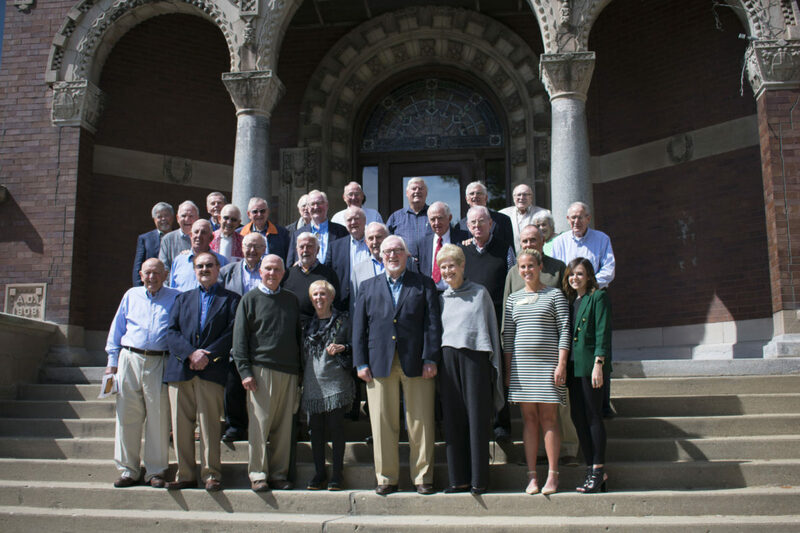 Alumni gathered at Loyola’s Dumbach Hall Sept. 13 to commemorate the building’s history as home to Loyola Academy, a Jesuit preparatory high school. The late-morning ceremony took place in Dumbach Hall to honor Rev. Henry J. Dumbach, S.J., who established the academy’s building. 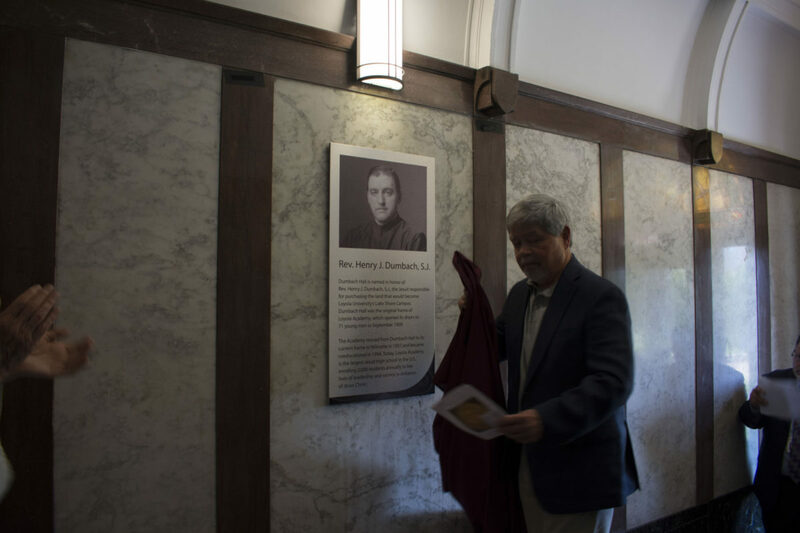 A memorial plaque was unveiled for Dumbach, displaying his image and a brief history of the building’s origin. The short ceremony took place at the east entrance of Dumbach Hall on the Lake Shore Campus (LSC). Loyola Academy alumnus Bill Rooney said he got the idea for a plaque three years ago when he visited campus for his granddaughter’s graduation from Loyola University. 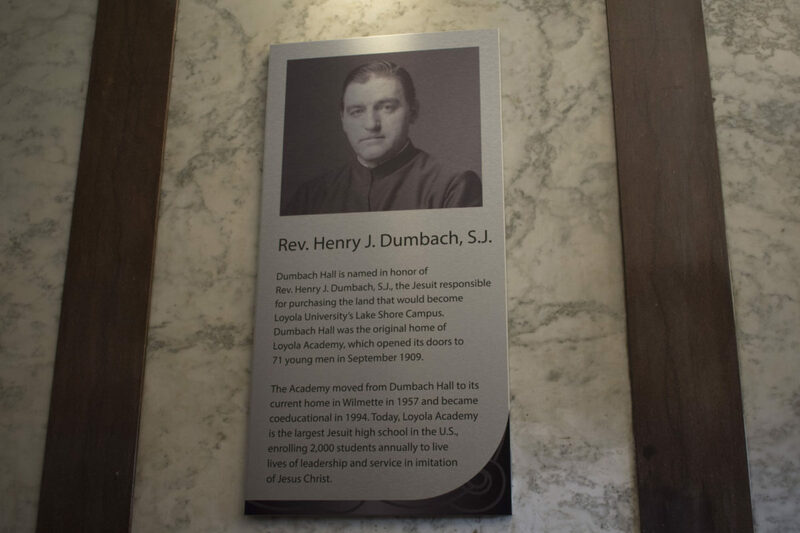 Rooney, 81, who graduated from Loyola Academy in 1954, said he wanted the plaque to preserve the history of Dumbach Hall and its origins. The memorial was blessed by Loyola Academy alumnus Rev. Robert Oldershaw. Mass preceded the ceremony, followed by a lunch at the nearby Bar 63 on North Broadway Avenue. 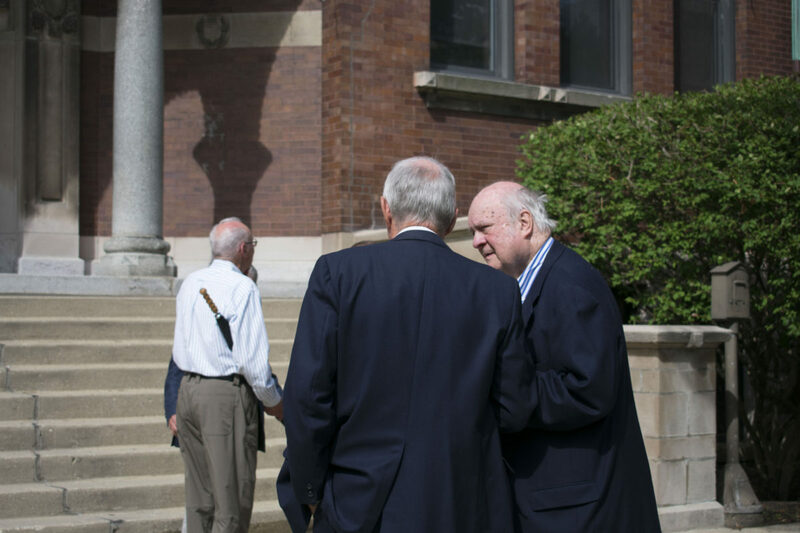 About 30 guests attended the event, most of whom were alumni who graduated before Loyola Academy moved from Dumbach Hall to its current location in Wilmette. 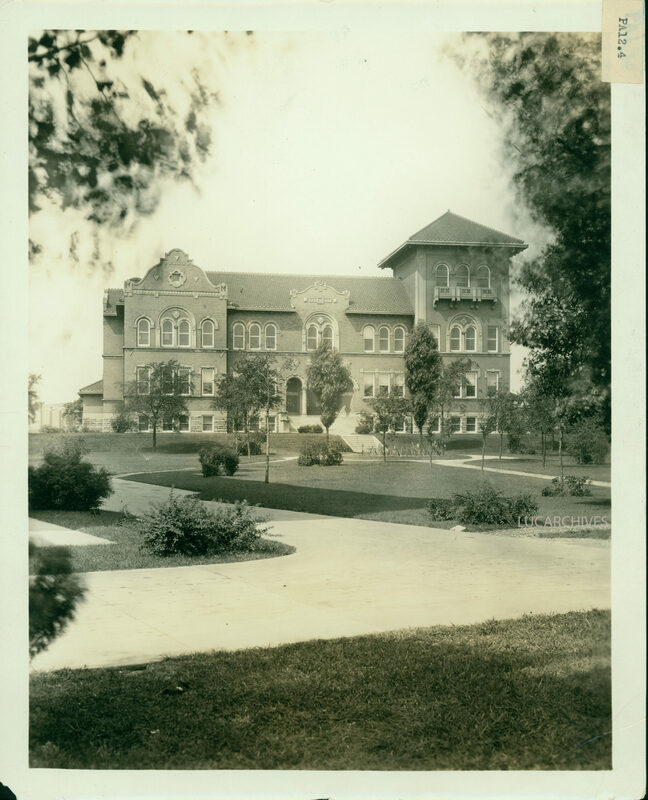 Dumbach Hall opened in 1909 as the home of Loyola Academy and brought in 71 men its first year. The St. Louis Jesuit Province gave Dumbach the money to buy the building’s land on LSC. Loyola University always owned the building, but it was used by Loyola Academy until the high school moved to Wilmette in 1957. 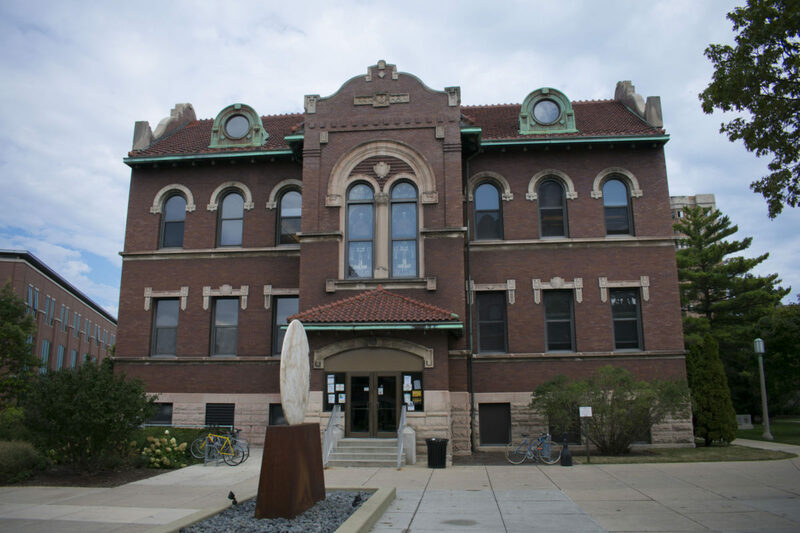 The university didn’t have a presence on LSC until 1912 when Cudahy Science Hall was built, according to University Archivist Kathryn Young. Today, Loyola Academy has about 2,000 students enrolled, according to its website. Several graduates of Loyola Academy went on to study at Loyola University, according to Ashley Sanks, Loyola Academy’s alumni relations coordinator. 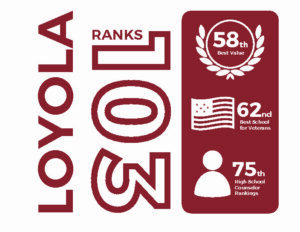 More than 200 Loyola Academy graduates studied at Loyola University in the past 10 years. Sanks said many Loyola Academy graduates attend other Jesuit universities as well. Loyola Academy alumnus John Schornack, 86, said he felt privileged to be at the event and relive the memories of his high school years. Schornack graduated in 1947 and said he liked how Loyola’s campus transformed around Dumbach Hall. 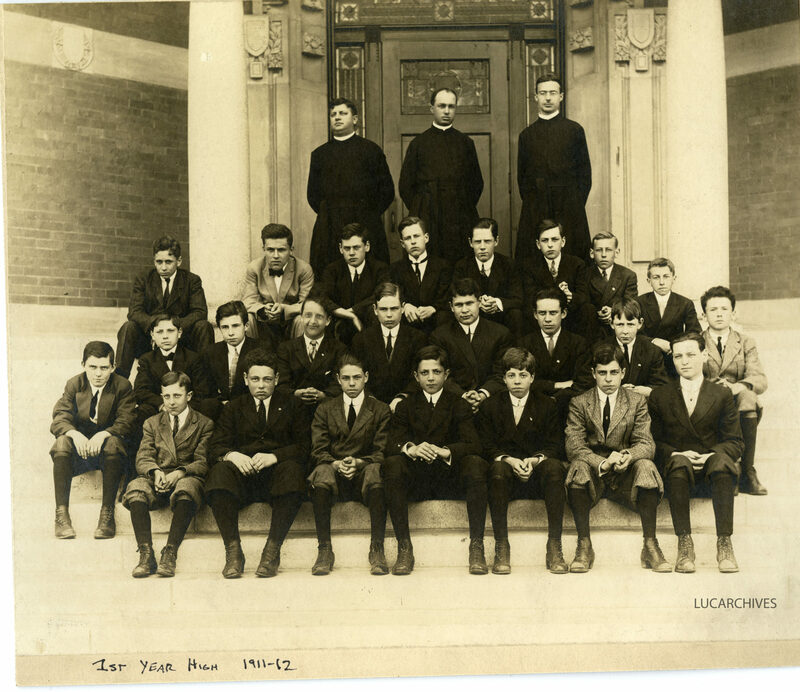 Loyola Academy has around 24,000 alumni; most are men because the school was an all-boys institution until 1994, according to Sanks. Sanks, who graduated from Loyola Academy and Loyola University, said the tradition of Loyola’s mission holds strong at both campuses.